Ready? Okay, without further ado, I will hand the reigns over to Deb! Well, first let me say thanks, Jessica, for having me on the blog and for letting Deb do this interview with me. And for my bag, which I LOVE! And I am very excited to be here! 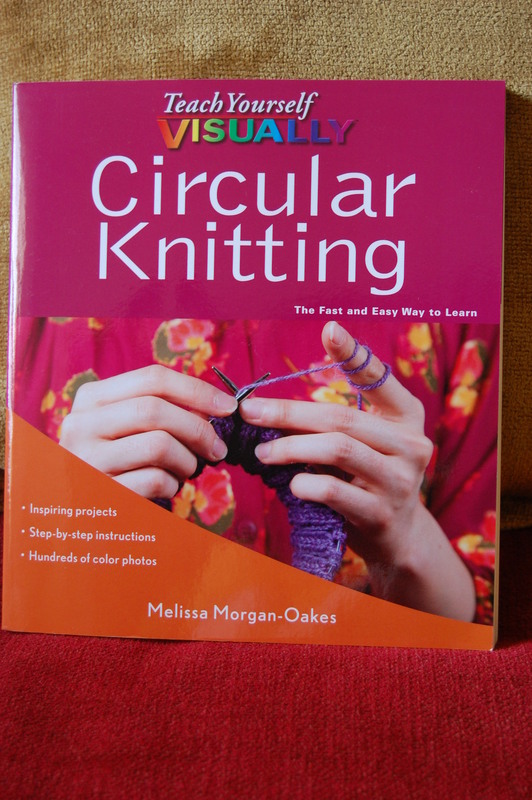 My new book is Teach Yourself Visually Circular Knitting, which is a pretty thorough text that teaches the four basic methods of circular knitting; double points, a circular needle with an object that fits on it exactly, the “magic loop” method, and knitting with two circulars. There are also 16 patterns ranging in complexity from simple hats to more complicated steeked garments, and just about everything in between. 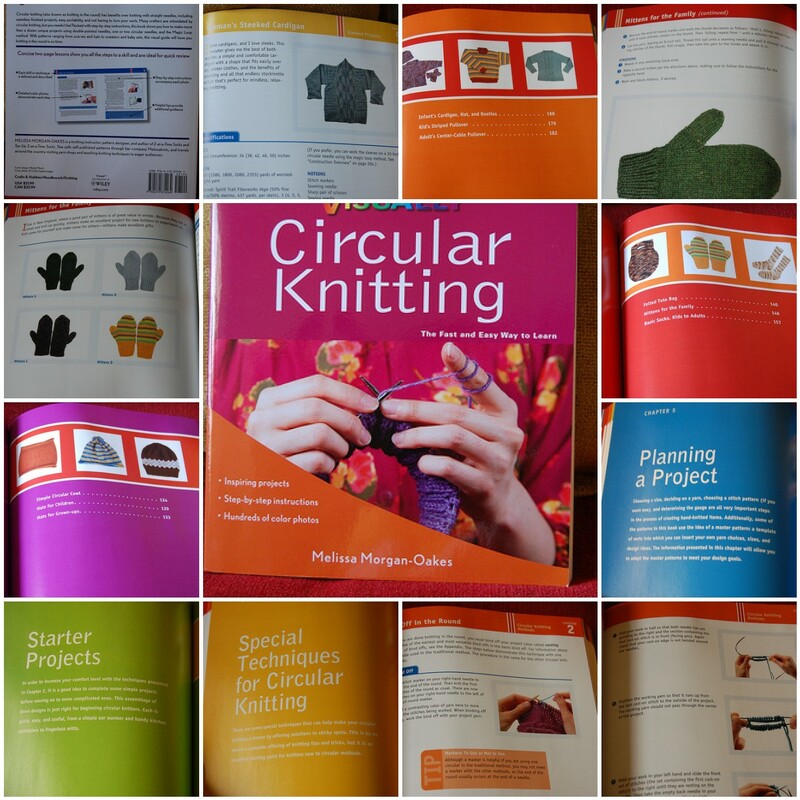 If you are new to knitting and want to find out all about circular knitting, this is the book for you. if you’re an experienced knitter who’s only ever knit on double points and want to know what circulars are all about, this is the book for you, too! And if you’re a knitter who knows their way around circulars, but wants to up your game with fun things like steeking, then this is YOUR book as well! Since the book is about circular knitting … is this your preferred method of knitting? Or do you like flat knitting also? I will always knit in the round if I can find a way to do so. 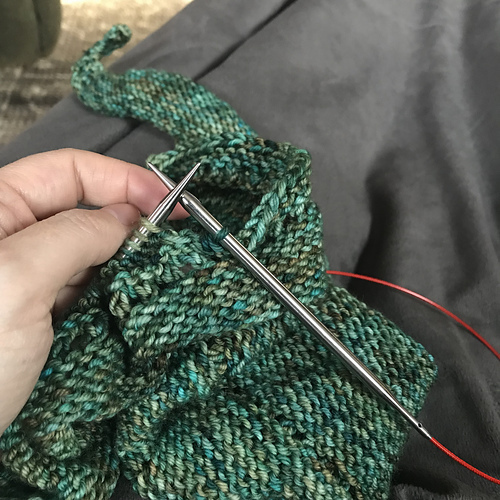 I am not big on two circulars, because I always feel that if I can get away with only buying one set of needles, I will. I do knit back and forth when I have to, but if I can convert or write a pattern for circular knitting, I absolutely will. And it’s not that I don’t like purling – I actually enjoy purling just as much as I enjoy knitting – maybe more. What I don’t like is lots of time spent finishing! Circular knitting generally means MUCH less finishing and that’s a very good thing. Do you ever use traditional straight needles? Yes – but only when I have to! I have a complete collection of straight needles that I won’t ever part with, but they get a lot less use than the circs do! Your last two books were about socks–have you said all you wanted to say about them? I don’t think anyone could ever say everything there is to say about socks! For right now, though, although I am knitting them I don’t have a lot new to say about them. But that could always change! It seems like knitters will never get tired of new books and patterns about socks–what do you think the appeal is (other than cold feet)? Knitters are smart people. They appreciate the portability and design flexibility of socks. And they know that a $30 investment in yarn to knit a pair of gift socks will usually be more safely received than $145 spent on yarn for an intarsia sweater that the recipient mightn’t ever wear. Socks are endlessly fun, adaptable, portable – they are in many ways the perfect project. I am currently working on a secret project for Carol Sulcoski’s next book, but I can’t say what it is yet – except that I love it and want to keep it for myself! The “Teach Yourself Visually” series is well known for giving basic instructions with lots of good photos–Did knowing how many photos there would be affect the way you decided what to write? Actually, working within the TYV series’ structure was difficult for me. I am not a particularly structured person. Having to edit what I needed to say into little snippets with accompanying photos that I could not seem to visualize in my head was not easy for me. I had an excellent technical editor, Tamara Stone-Snyder, who stepped in and handled the organization piece. That made things flow much more smoothly. Writing on a topic and letting someone else chop it up into snippets was the only way this book could have happened, really! Your bio says you’re a self-taught knitter. What was the best reference you had when you were learning to knit? I taught myself to knit using Vogue’s Ultimate Knitting Book. I learned a lot from that book, actually and it is never far from my side. Except for about a week when the cat did something very bad on it, and I had to wait for a new one to arrive! What’s the best (knitting) advice you ever got? “It’s just knitting”. I see a lot of students getting overwrought about errors in their work, or a perceived inability to “get” something – and I do believe most of that is perception. Anyone can learn to knit, and knit well. I find that kids are easier to teach because they are willing to try and try again until they get it. As adults we have been, maybe, over-educated, beaten down by work, and many knitters place much to much emphasis on competition, so we quit before we’ve ever half begun – “But SHE got it right away and I am struggling so I just must not be able to do this! !” WRONG! Tell yourself, from the beginning, “It’s just knitting. It’s meant to be fun. It is not brain surgery. I can do this”. No one will die if you mess up, no one cares how fast or how slow you learn, and it doesn’t matter if your learning style is different from your neighbors’. Just relax and (most importantly) keep trying, and you WILL get it. What got you started knitting in the first place? Well, truthfully, I learned because I had started hand spinning and was churning out pounds of yarn, and there were only so many crochet patterns in the world to use it all up! I was a little bored with the hook. Now, although I adore knitting, I sometimes find myself missing the hook! What’s your favorite part about knitting? The actual knitting? Having a finished product? The creativity? I am very much a process knitter, and am usually very unattached to the finished product. I love the knitting, the creating, the altering and jigging of a design, and the occasional brain tease along the way. Once it’s done it can go off into the universe and adorn someone other than myself, and I don’t mind at all. 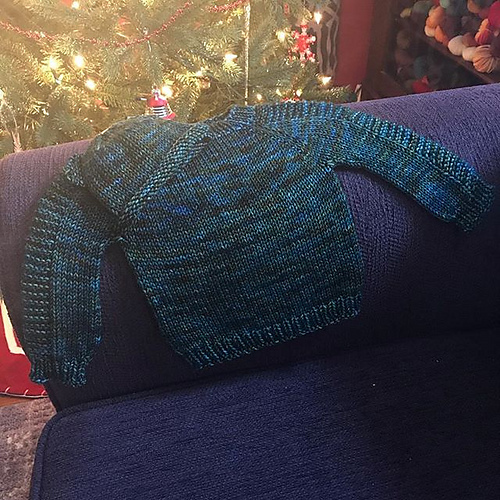 I was just glad to have had the chance to knit it! Do you primarily knit for yourself or for others? You may be able to guess from that response above – I give much more than I keep! I keep socks for myself, and sometimes will knock out a sweater for me. In fact, I plan to do more of that in the next year or two. What do you find is the hardest thing to teach when you give knitting classes? Self-confidence! It’s usually much less about teaching specific techniques and much more about teaching people to allow themselves to learn. I consider instructors to be facilitators. My job is to enable the student to learn. Sometimes – most of the time – in a sticky situation what I really need to do is convince the student that they CAN learn this. Students say I am sadistic because in a class like Knitting 1 or Knitting 2 I love nothing better than making them drop a stitch and pick it up again, or taking their knitting away and changing the orientation of the stitches, then returning it to the knitter to “fix”. The reason why I love that so much is because I love the “Ah-ha!” moment when a student realizes that they DO know what they are doing and they CAN fix it themselves! I get the same (sick?) joy when we turn heels in my 2-at-a-Time classes. Watching people realize that it works, and they can do it, is my favorite part of teaching! So, you’ve done socks. You’ve told us all about circular knitting … What’s your next project? I have absolutely no idea! I have no real plan; I am just sitting back and taking a breather. I have had a pretty whirlwind few years, putting out three books in a very short amount of time and I would like to take some deep breaths. Maybe design single patterns for publication, maybe spend some much needed time in my garden! As we enter Summer … do you prefer the hot weather? Or cold? Neither! I am a temperate flower. If you could find me a place on earth where it’s between 45 and 75 degrees F. all year round, with gentle breezes and bi-weekly rain, preferably within comfortable driving distance of a beach I’d be all over it! Eggs! Over easy, but perfectly done, and direct from my backyard. There is nothing better! If you had an extra two hours in the day, what would you do with them? Knit. At this time of the year, with the farm bearing down on me, and the garden growing out of control, I’d use extra time to knit, for sure! Name one yarn you’ve never tried but would love to knit with. At the moment my fingers are itching to get all over Lorna’s Laces new sock yarn, Solemate. There are others, but that’s the one that jumps right into the front of my brain. What is the one thing you would want to say to a new knitter? “Yes, you can”. Just write that in very big letters on a big sheet of paper and stick it where you see it every single time you look up or away from the knitting. If you could have a superpower (knitting or otherwise), what would it be? Teleportation! I hate to fly, and just being able to say “I want to be over there” and having that happen without an airplane would be a wonderful thing for me! “Would you like your 20 million dollars all at once, or in installments over the next 20 years?” I’d probably want it all at once, but my husband would reason with me that we’d get a better deal on taxes if I took it in installments! Thank you very much for having me! This has been a blast – you have great questions! That was such a great interview! Thanks again, Deb! If you’d like to read a review of TYVCK, Deb’s review is up at her book review blog, Knitting Scholar. If you are following the tour, Melissa’s next stop is at Rock and Purl tomorrow! Now, to celebrate Melissa’s visit to the blog today, I am giving away not one, not two, but THREE copies of Teach Yourself Visually Circular Knitting! All you have to do is leave a comment here – if you want a second entry, tweet about it and include my twitter name @jessalu or @stitchedbyjessa so I can track it! If you want a third entry? Post it on your Facebook page and let me know here with another comment. Contest will close at midnight tonight, I will choose the winners over the weekend and post them on Monday! Thanks for playing and good luck! Posted in Wanna Win Something? Tagged wanna win something?